Growing up the youngest of 10 children, things in the Christmas baking department were probably a little different for me than my older siblings. It was the most exciting of times, and my memories are so vivid. Let me start by giving you a little history of how MY pre Christmas ritual went. I can remember it always being snowy and SO cold around when the older kids were due to return home for Christmas break. The anticipation would drive me crazy, the thrill of us all being together and of course getting loads of attention for weeks! HA! My mom would let me get all dressed up and bundled up. My sister or brother who was due to come home would always call before they left so she would know about when they would arrive. I would sit on the front porch and when the respective sibling would pull around the corner, I would run into the house screaming "PEGGY IS HOME, or KAREN IS HOME, or JIMMY IS HOME", almost as if it was my duty and responsibility to announce the arrival of each big sister and brother arriving to spend Christmas at home. What wonderful memories. 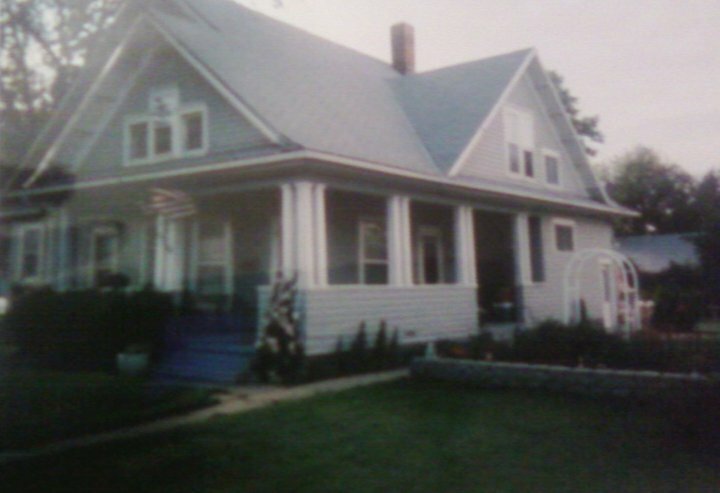 We still have most of the same traditions, although our family has grown out of that originally 7 bedroom, 2 bath house and we have to celebrate Christmas in a school gymnasium. 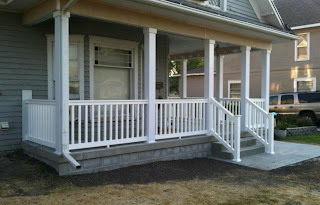 Here is a photo of that old front porch I would wait on! Anyway back to baking. We would make SO many sugar cookies. It seemed a never ending task, baking sugar cookies, candy cane cookies, Russian teacakes, spritz cookies, divinity, fudge, banana bread, fruitcake and PEANUT BUTTER BALLS! My mom would spread newspaper over the entire dining room table. She would put out bowls of different colored frosting, sprinkles, those little silver things that could break your teeth, and colored sugar. We would spend hours decorating, laughing, listening to Christmas music and talking. However, when it came time to make peanut butter balls, this is when I got extra excited! Looking back on those peanut butter balls, they were a little dry inside. I didn't care, but as an adult, I thought it was time to improve upon them. I don't know where my mom got her recipes, she probably doesn't know. I am sure it was likely a church cookbook though! She would always melt wax into her dipping chocolate. Did anyone else's mom do that? They would glisten and she would let me sneak one while the chocolate was still gooey and warm. These peanut butter balls came out incredible. I have a flashback of my childhood with each bite, and trust me, I had so many memories (bites) the day I made these, I think it would qualify as a past life regression session. They are so creamy inside, a little crunch and then the sweet milk chocolate on the outside. Please enjoy these, and I wish you and yours the most blessed Christmas season, full of laughter, love, memories and the hope celebrating the birth of our Savior brings. 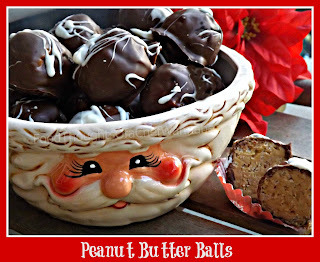 Easiest, tastiest, creamiest, yummiest Peanut Butter Balls, EVER! Line a cookie sheet with foil or parchment paper and set aside. Combine, peanut butter, butter, vanilla, and powdered sugar. When it is completely combined, add rice krispy cereal and mix until completely combined. Roll the mixture into balls. I rolled mine on the large side, about a 3 biter size! I got 24 balls, but if you make them smaller you will get more. When the balls are all rolled, place into the freezer for 1 hour. In a microwave safe bowl melt your chocolate, 30 second increments at a time. When it is all melted add 1-2 tsps of vegetable oil. Mix until combined and dip away! Place the ball in the chocolate, coat and put back on your cookie sheet. If you are going to garnish with white chocolate, melt at this time, if you need to add some vegetable oil to make it thinner to drizzle do so. Drizzle all of the peanut butter balls. This is completely optional. When you are done, refrigerate for 2 hours, then serve or freeze until you need them for Christmas or cookie trays! Thank you for walking down memory lane with me. I like to go there from time to time with you all, and in my own travels. I love you mom, but my peanut butter balls........will make you never want yours again! Yay! My friend and I have been making many different flavored cake balls for the last couple weeks! She makes a batch and sends me some, and I always return the gesture. Well it's my turn and I have been looking for a different recipe. I have found it! I will definitely make these and make memories as you and your family have done. Happy Holidays to you and your family from your Cajun Cousins! Love the memories you shared and these peanut butter balls look amazing, too! Absolutely Wonderful! Love it!!! Thanks so much for sharing these delightful memories!!! Thank you so much for sharing your families recipe! That's really sweet of you. I think that's why a lot of us like to bake/cook ...we're trying to recreate a lot of those memories! Beautiful! There were 11 of us kids--I can relate with some of your experience! I think it must have influenced how you cook and why I like your blog/recipes so much! Wow, 11!!! Sure made from an interesting childhood didn't it?! Thanks for reading, it is great to have you!